Ayesha Siddiqa Bugvi is a lecturer at the Institute of Social and Cultural Studies. She has 14 years of professional experience that includes serving in various universities of Punjab. She is currently a PhD scholar in Sociology at University of the Punjab. She has done M.Phil in Sociology in 2011. She was a gold medalist in M.Sc. Sociology from University of the Punjab (session 1998-2000). She started her career as a Social Welfare Officer (BPS-17) in Govt. of the Punjab and worked there from 2002-2007. Later, she joined as lecturer in University of Gujrat from 2007-2008 and Forman Christian College (A Chartered University) from 2008-2010. 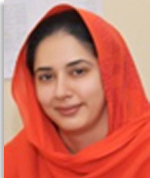 She has joined University of the Punjab as lecturer in 2010. Since then she has been actively involved in teaching, research and student mentoring. Her PhD research work focuses on the social and managerial challenges in Lady Health Worker Program in Pakistan. Her research interests are varied which focuses on public health issues like child immunization, health care service utilization, primary health care, lifestyle behaviours of university students. Moreover she also studies resettlement issues of displaced population. She has received trainings from World Bank in the area of Resettlement and Rehabilitation and currently a team member at the National Center for Resettlement and Rehabilitation (NCRR) at ISCS. She was a Visiting Scholar at Arizona State University, USA from August-December, 2016 as part of a University Partnership Program between Arizona State University, USA and the University of the Punjab, Pakistan.